Nothing feels more like home than your city's skyline. Take in the view of Fountain Place, Reunion Tower, and so many more iconic buildings with this navy blue, super soft all cotton tee. 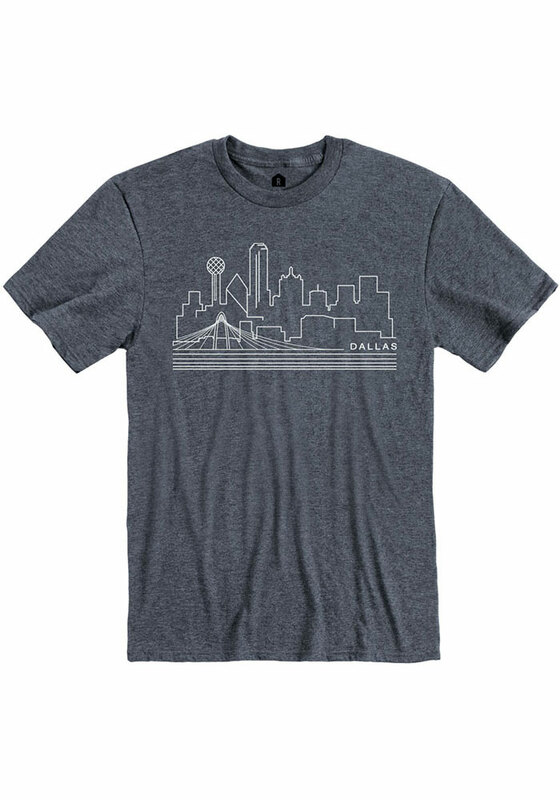 This unisex t-shirt features a screen print of the Dallas, Texas skyline on the front center chest. Awesome shirt and even better support. I bought this shirt thinking it would be like most other shirts you order online and not be true to size. It is, I ordered a large and it was a little tight, sent it back and in two days the same shirt in xl was already shipped out to me. So in the time it takes most to ship items to you, I will have received, returned and received again. Will add Rally House to my go-to places to shop online. The clever front design is always a good conversation starter, especially while traveling. I have had this shirt for a couple years and it has held up great. Cotton blend material did not shrink or get weird fitting and it was soft off the rack. I am 6' 185lbs and a large fits me perfectly.